An inclined plane, at its most basic definition, is one of the six simple machines defined by Renaissance scientists. You know, like the screw, the wheel, levers and pulleys. Essentially, there are two cars and a track, similar to a train. One starts at the top and the other at the bottom. As the top one is loaded with weight, it pulls the other from the bottom to the top. 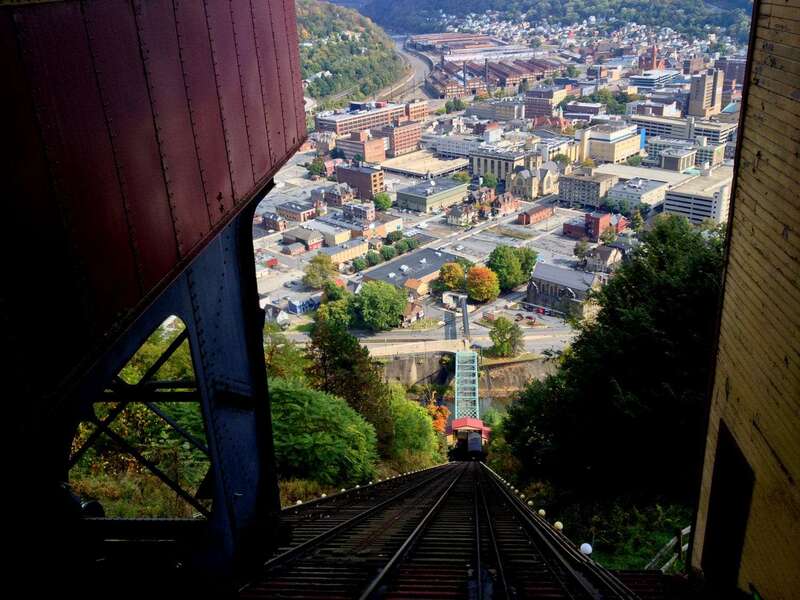 Funiculars, basically mechanized inclined planes used to haul people, cargo and vehicles up steep terrain, are relatively abundant in Western Pennsylvania. There are two in Pittsburgh, but the one in Johnstown holds the title of “Steepest Vehicular Inclined Plane”. I’m not completely certain as to whether “vehicular” refers to its ability to carry a single automobile in its cars, or that its powered by a 500hp electric motor, and such details are irrelevant. 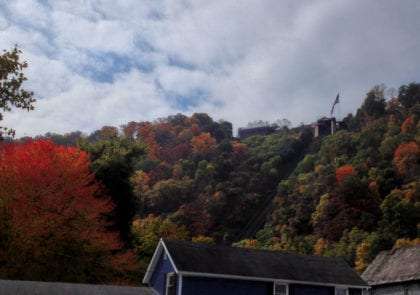 The inclined plane here in Johnstown is about freedom and innovation. It’s about an age of industry, of conquering mountains. Coal was being excavated from every available mountainside, by thick skinned and black lunged miners–my father and his father among them–who crawled on their hands and knees, picking at coal and loading it into buckets to be sent off to homes and industry alike, to fire this nation’s churn into the Industrial age. Molten steel was molded into girders which would support the high rises of a nation growing far above its natural elevation. Looking back, such efforts were devastating to the environment, but what could not be seen as clearly then is still keeping the railroads, skyscrapers and automobiles of the modern age separating us from a more primeval world. Even most steadfast environmentalists use this infrastructure on an every-single-day basis. Johnstown is not the next Pittsburgh, and it never even came close to being. Andrew Carnegie was one of some fifty other members of a fishing and hunting club nestled around the banks of a small body of water formed by a dam originally created to aid in transportation via canals in the area. As trains became the dominant means of transporting freight–trains built by and riding atop Johnstown’s steel–the dam was sold multiple times before becoming the property of Carnegie and his fellow tycoons. The dam itself was left very much unmaintained, and one stormy night in 1889, it burst, sending water cascade plummeting down the Conemaugh Valley. Johnstown was obliterated, over 2,000 people were killed. 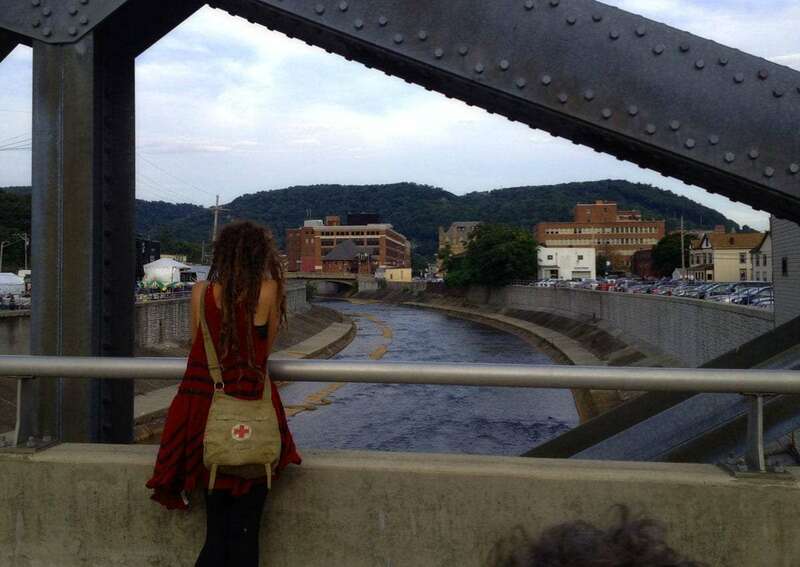 The US Army Corp of Engineers built these massive walls, dredging the river and declaring Johnstown “Flood Free” after the 1936 flood. Two more floods would again destroy the city, along with the Great Depression and changing attitudes toward the environment and EPA standards that suffered the cities eventual demise. 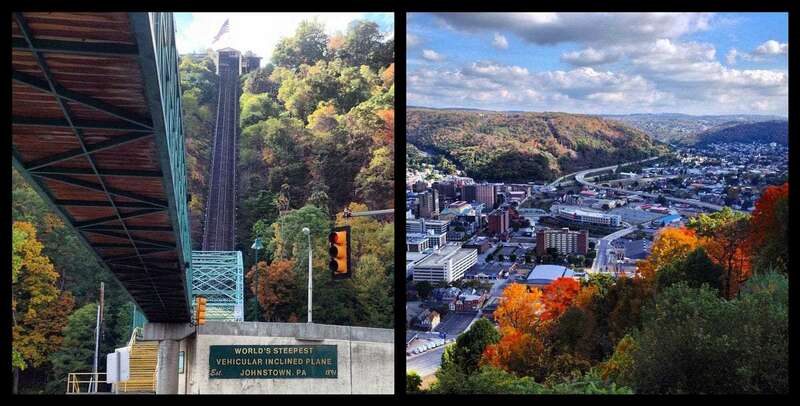 Today, Johnstown is home to some 20,000 people. Tall enough buildings and abandoned factories are abundant. Victorian houses, once grand, wear ivy robes and show their bones through lost siding and shingles. It is a place of beautiful dilapidation, and while I would love to claim the signs of revitalization–a massive motorcycle gathering every year, a large hippie festival, both which attract visitors from far outside of the city limits–I believe that a true revitalization is still some decades away. 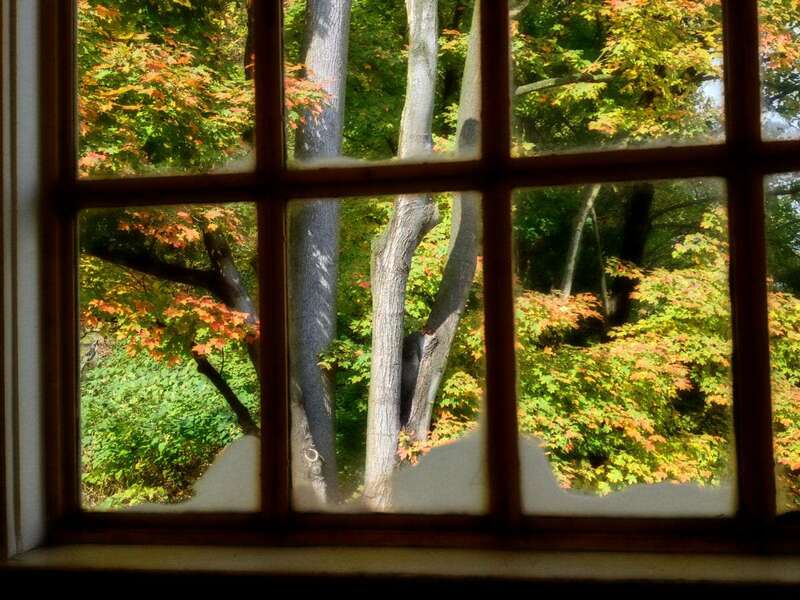 Still, these are sometimes our most favored places to visit. To see ghosts in the present chaos of some past life. To imagine a bustling downtown full of blue collar workers bumping elbows with men powerful enough to change the world. The inclined plane is still going. Every fifteen minutes it trades its elevated car for the one below. Mostly used by tourists these days, it is the notion of how everything in this nation works–how every neighborhood in every city, every single life–times of boon and blight, embodied.